The Greater Antillean Grackle (Quiscalus niger), is a native bird of Cuba. It is also found on other major Caribbean islands such as Puerto Rico, Jamaica, and Hispaniola hence the name “Greater Antilles” (Neotropical birds). The Greater Antillean Grackle is divided into seven subspecies that are found in smaller islands separate from the Greater Antilles. The Greater Antillean Grackle belongs to the Icteridae family which are basically the blackbirds found in the New World (Oiseaux-birds). 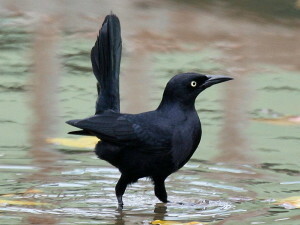 There have been a number of Grackles observed in the United States and Mexico even though those Grackles belong to different subspecies rather than the Greater Antillean Crackle (Quiscalus niger), it is significant to understand what it is that distinguishes the Greater Antillean Crackle from the other Grackles (Powell, Alexis). The Greater Antillean Grackle is found in several areas of Western and Eastern Cuba (Oiseaux-birds). Since it ranges throughout the Great Antilles, it migrates extensively between islands. 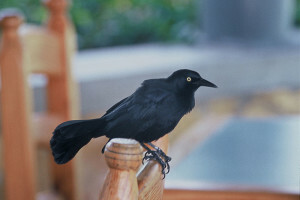 The Greater Antillean Grackle is quite common and abundant in the Cayman Islands or the Isla of San Pedro closely to Cuba (Geographic Range). Some Greater Antillean Grackles migrate from the North to Cuba during the spring season (Ricklefs, Robert). Orlando H. Garrido “a founder of both the Cuban Academy of Science,” wrote an article describing the evolution of the Grackle subspecies on the mainland to the cays in the Island of Cuba. The Greater Antillean Grackle found on the cays of San Felipe are known to be evolving because of their morphological differences compared to other grackles (Garrido, Orlando). Also, many of the Greater Antillean Grackles are found in Puerto Rico or in Jamaica often migrate to Cuba (Tognetti, S). The preferred habitats of the Greater Antillean Grackle are open areas. The Grackles tend to go to urban areas that have tree and water edges (like beaches, lakes, or any aquatic areas). “It also frequents mangroves and marshes. It is very common in lowlands” (Oiseaux-birds). Esther Morales is part of the research staff at Jobos Bay National Estuarine Research Reserve that is a protected estuary that protects the avian community. 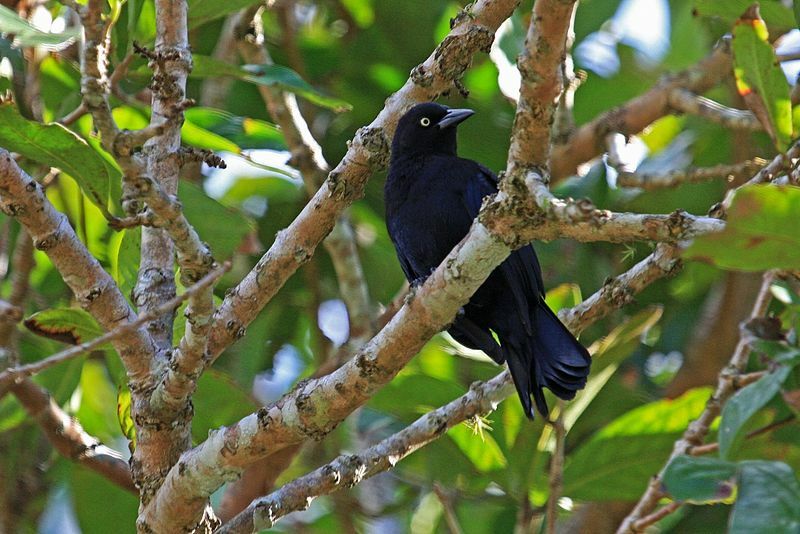 The Greater Antillean Grackle was one of the most abundant species within the reserve and has been extensively studied within this reserve (Morales, E). One of the major ways to distinguish the Cuban Greater Antillean Grackle from other Grackles in surrounding islands is by their physical appearance. The Greater Antillean Grackle adult male has a beautiful black glossy-like plumage with a “purplish or blue iridescence on entire body and head” (Fraga, R). The pale yellow eyes of the Greater Antillean Grackle (Quiscalus niger) is a major species feature as well. Male Grackles tend to fly with their tails open (Oiseaux-birds). The male Grackle is usually bigger than the female Grackle and their tails and color differ from each other (Neotropical Birds). Young Greater Antillean Grackles have a dark brown shade with dark eyes different than the adults. 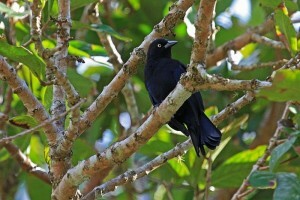 The Cuban Grackle is smaller than grackles found on other islands, and the Puerto Rican Grackle is the largest sized Grackle in the Greater Antilles (Tognetti, S). 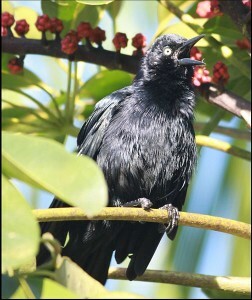 The many types of Grackles found on the different islands of the Antilles can be distinguished by variations in their mitochondrial DNA. Geographical ranges also influence these mitochondrial differences. Morphological variation among the sub-species is also observed. As noted, color variation is significant since some Grackles are black or purple for different hybridizations (Zink, R). “Bill anomalies are generally thought to be genetic in origin and genetic changes in bill shape can occur rapidly in a population” (Williams, E). This was an observation where double color spot pattern modification in the Grackle that indicates how the Grackles have been evolving over time. Greater Antillean Grackles have a simple diet. Their feeding habits consist of insects (mainly lizards), seeds, rice, maize, or fallen scraps of fruits that people drop on the floor. That is why the Greater Antillean Grackles inhabit urban areas where they are able to find food on the ground (Neotropical Birds). A female adult Grackle was observed to have consumed a large male Anolis grahami (anole lizard) that is 6.3 in long while a female Grackle is 9.11 in long. This portrays how the Grackle is capable of eating various size species. They also prey on seven different types mainly Jamaican lizards (Graves, G). Furthermore, the Greater Antillean Grackle is known to migrate between different agricultural sites (like rice or maize) that specific islands have in search for food (Post, William). Just like any other birds in the Greater Antilles, the Greater Antillean Grackle has a unique sound. The female Grackles rasp in order to call on their young ones. “It forms large roosts where the birds gather at night with other Icterids’ species” (New World Blackbirds). They display a “ruff-out”, with a raised tail and their wings are drooped while they are singing (New World Blackbirds). Each Greater Antillean Grackle on other islands have their own sound, and the Grackle in Cuba differs from the rest in the sense that they are a little more noisy and add a metallic tone to it making it “musical” (Xeno-canto Foundation). 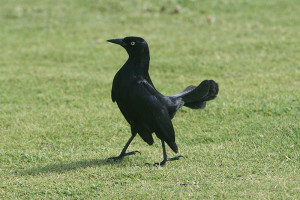 The Grackle has a confident behavior that enables it to interact with humans and other birds. Once again, they seek for urban areas where they are able to find food on the ground so they are obligated to interact with others. They behave as common ground birds. Since they seek urban areas they aren’t usually territorial (Global Species). The mating process of the Greater Antillean Grackle involves breeding that mostly occurs (depending on the island they are located in), from April to September. The female Grackle “lays 3 to 5 pale eggs with dark markings,” in bulky strong nests made of stems and grass (Oiseaux-birds). The incubation process takes place from 23 to 25 days after hatching in order for the young to start fledging (Nature Watch). There were studies conducted on the brood parasitism of the Greater Antillean Grackle. The article explains the grackles host interactions and brood parasitism. Brood parasitism is the idea of species raising the young ones of other different species. An experiment between cowbirds and the Grackle was conducted in order to see how the Grackle would respond by using sets of eggs of the cowbirds. “Grackles…they are largely unparasitized by cowbirds and (like all other colonial Icterines) do not practice conspecific brood parasitism” (Peer, B). The Grackle knows how to distinguish their eggs from other nests and do not accept brood parasitism. Therefore, they have an “egg rejection behavior” (Peer, B). Only 41 percent of the Greater Antillean birds have proven that they are non-brood parasitic yet many Grackles have not produced a behavior against brood parasitism (Wiley, J). Garrido, Orlando H. “Natural and Man-Induced Evolutionary Shifts in the Birds of some Cuban Cays.” Bird Conservation International 2.1 (1992): 1-6. Lion Search. Web. 15 September 2015. Peer, Brian D., and Spencer G. Sealy. “Fate of Grackle (Quiscalus Spp.) Defenses in the Absence of Brood Parasitism: Implications for Long-Term Parasite-Host Coevolution.” The Auk 121.4 (2004): 1172-86. Lion Search. Web. 16 September 2015. Peters, James L. “Revieof the Grackles of the Genus Holoquiscalus.” The Auk (1921): 43553. Lion Search. Web. 10 September 2015. Post, William, Tammie K. Nakamura, and Alexander Cruz. “Patterns of Shiny Cowbird Parasitism in St. Lucia and Southwestern Puerto Rico.” The Condor 92.2 (1990): 461214. Google Scholar. Web. 10 September 2015. Powell, Alexis F. L. A., F. Keith Barker, and Scott M. Lanyon. “A Complete Species-Level Phylogeny of the Grackles , Including the Extinct Slender-Billed Grackle, Inferred from Mitochondrial DNA/Filogenia Completa a Nivel Especifico Del Genero Quiscalus, Incluyendo La Especie Extinta Quiscalus Palustris, Inferida a Partir De and Mitocondrial.” The Condor 110.4 (2008): 718. Lion Search. Web.10 September 2015. Ricklefs, Robert E. “Stage of taxon cycle and distribution of birds on Jamaica, Greater Antilles.” Evolution (1970): 475-477. Lion Search. Web. 10 September 2015. Wiley, James W., William Post, and Alexander Cruz. “Conservation of the Yellow- Shouldered Blackbird Agelaius Xanthomus, an Endagered West Indian Species.” Biological Conservation 55.2 (1991): 119-38. Google Scholar. Web. 15 September 2015. Williams, Ernest H, Jr, and Lucy Bunkley-Williams. “Three Anomalies: A Scythebill in the Greater Antillean Grackle (Blackbird), a Crown Pattern in the Rock Beauty (Angelfish), and a Double Spot in the Butter Hamlet (Grouper), and their Possible Genetic Significance.” Revista de Biología Tropical 54 (2006): 161-9. Lion Search. Web. 15 September 2015. Zink, Robert M., William L. Rootes, and Donna L. Dittmann. “Mitochondrial DNA Variation, Population Structure, and Evolution of the Common Grackle (Quiscalus Quiscula).” The Condor 93.2 (1991): 318-29. Google Scholar. Web. 15 September 2015. Fraga, R. Greater Antillean Grackle (Quiscalus Niger). Handbook of the Birds of the World Alive. 2011. Web. 15 September 2015. Graves, G. Greater Antillean Grackle (Quiscalus Niger). Preys On Anolis Grahami. 2006. Web. 15 September 2015. Greater Antillean Grackle. Geographic Range. 2015. Web. 15 September 2015. Greater Antillean Grackle (Quiscalus Niger). Nature Watch. N.d. Web. 16 September 2015. Greater Antillean Grackle (Quiscalus Niger). Neotropical Birds. N.d. Web. 15 September 2015. Greater Antillean Grackle (Quiscalus Niger). New World Blackbirds. N.d. Web. 15 September 2015. Greater Antillean Grackle (Quiscalus Niger). Oiseaux-birds. N.d. Web. 15 September 2015. Greater Antillean Grackle (Quiscalus Niger). Xeno-canto Foundation. 2014. 15 September 2015. Tognetti, S. Caribbean: Islands of Cuba, Hispaniola, Jamaica, and Puerto Rico. World Wildlife. 2015. Web. 16 September 2015. Quiscalus Niger (Greater Antillean Grackle). Global Species. 2015. Web. 15 September 2015. Wikimedia Commons. Wikimedia Project. Web. 4 September 2015.